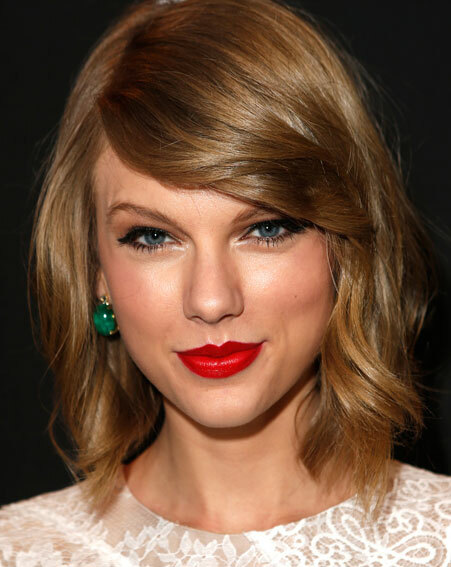 Taylor Swift’s ever-changing hairstyles – what do you think of her new short ‘do? What face shape does Taylor Swift have? Taylor has lovely facial features. Her latest hairstyle as you can see from the photo above taken 2nd March 2014 at the 22nd Annual Elton John AIDS Foundation Academy Awards, is the wrong shape for her face. Although she has a small face weirdly enough it makes her face look too big, although it obviously isn’t! Taylor’s had so many styles this year alone, I don’t mean haircuts just different styling. That is a good thing of course as she’s a country singer icon, although in my opinion she’s styling her hair over a cut that doesn’t suit. From looking at her face l can see that the length of her hair is a little too short, making her look fairly hard even though she has nice features. The fringe on its own is nice but compared with the length of the back it’s too heavy and out of proportion. Let me show you a few more ways she’s styled her hair based on her latest haircut, followed by my favorite Taylor hairstyle, where she’s got it so right. On the photo right taken 12 Jan 2014 at the 71st Annual Golden Globe Awards, this is roughly the same cut as the first but has been roller set. The curls themselves are very pretty BUT it makes her face look very small and round, almost gerbil-like! The fringe is tucked under which tends to make the face appear more round. There may be a lot of readers that disagree because the style as a standalone look is pretty, there’s no denying that fact but technically it doesn’t look good on her. On the photo left taken February 12, 2014 at The Celebrity Sightings In Los Angeles, the sides have been flicked out making her pointy jaw look more pronounced. I’m not sure why her hairdresser has styled it this way, maybe there under a lot of pressure to keep producing more styles! On this next photo taken on the 26 Jan 2014 at the 56th GRAMMY Awards, although Taylor has her hair piece in and looking quite a bit longer, WHY OH WHY did she tie it back. This style again is making her face look too round and gerbil like, all Taylor has to do is to take off the covered band, do a little styling with the hairdryer and/or hot irons and VOILA. On the last photo left taken on the 25 Jan 2014 at The Clive Davis And The Recording Academy Annual Pre-GRAMMY, Taylor has got this style PERFECT. I hope you agree that even seeing a subtle hint of hair on her shoulders and some hair to the right facing has made her face look softer, sexier and just about perfect in my eyes. Taylor’s used her hair piece to perfection in this style and you can see what it looks like if she grew it longer. My suggested look for Lily! From my comments above I think you have worked out that she needs to grow her hair. For heart shape faces you need to keep some fringe coming down on your forehead which Taylor has actually done, this is because you want to make your forehead appear smaller, then as soon as she grows the length (anywhere from 2-4 inches) and her layers down in proportion with the length, her fringe will then look much better suited. I wouldn’t recommend growing it very long either, as this would tend to make her face appear too small vanishing amongst all the hair. Taylor’s skin tone is quite light in complexion with piercing blue eyes, I agree with keeping her colour with-in the blonde family but I would be careful not to go to light, otherwise it may make her skin appear pale, blending into her hair a bit too much, then the colour would start to look weak against her skin tone. I prefer the last photo yet again, in this photo she has used a darker golden blonde, which makes her eyes and skin stand out so much more. What to ask for, or keep away from if you have an oval shape face My suggested cut would work perfectly. – a heart shape face This is Taylor’s face shape, so my suggested cut is perfect. – a square shape face Again it would work but I would cut round layers and keep the outline rounded too. I would cut into the fringe keeping it soft as possible and slightly moon shaped, which means shorter in the middle going slightly longer towards the ears, otherwise your square shape face may look harder. – a round shape face If you have a round shape face I wouldn’t wear this hairstyle too long, as it would be equivalent of having a short cut, which would make your face appear even more round. – a long rectangular face My suggested cut would work but if you have quite a long face then I would only recommend growing it another 1-2 inches compared to Taylor’s 2-4 inches. Definitely no shorter than the first photo. Your hairdresser would give you advice to exactly how long you could grow it.